Defects and impurities are one of the core problems in semiconductor materials research, which has decisive influence on some properties of semiconductors. Zinc oxide (ZnO), as a representative wide band gap semiconductor, has attracted the interests of many people and institutions for a long time due to its significant potential applications in optoelectronic devices, photocatalysis, energy conversion and other fields. However, the defects and impurities in ZnO have not been fully understood. The effective P-type ZnO cannot be prepared so far and even the high pure ZnO crystals exhibit N-type conductivity. The complexity of defect and impurity greatly limits the application of ZnO. The group of Shijie Xu, professor of physics at the University of Hong Kong, had found for the first time that ZnO crystals can exhibit long persistent phosphorescence (LPP) under certain conditions. It was proposed to be a new method for studying the defect state of semiconductors. Under low temperature and below band gap (BBG) optical excitation conditions, the green, yellow, and red luminescence of ZnO was reported to survive for more than 10 minutes after ceasing excitation. The intensity of afterglow exhibits non-single-exponential decay and non-monotonous temperature dependence. After comprehensive analysis of the related phenomena, it was suggested that the LLP originates partially from the electrons trapped by shallow donors under optical excitation and partially from the free electrons in conduction band. The participation of free electrons is different from the traditional trapping-detrapping model for LLP, so this is an important improvement to the traditional theory for phosphorescence. The new model was further quantified by an analysis formula, by which the depth of the involved defective level was obtained. Besides ZnO, the generality of this model was also conformed in other materials such as GaN. Therefore, it was expected to be a new method to probe the shallow defect states in semiconductors. 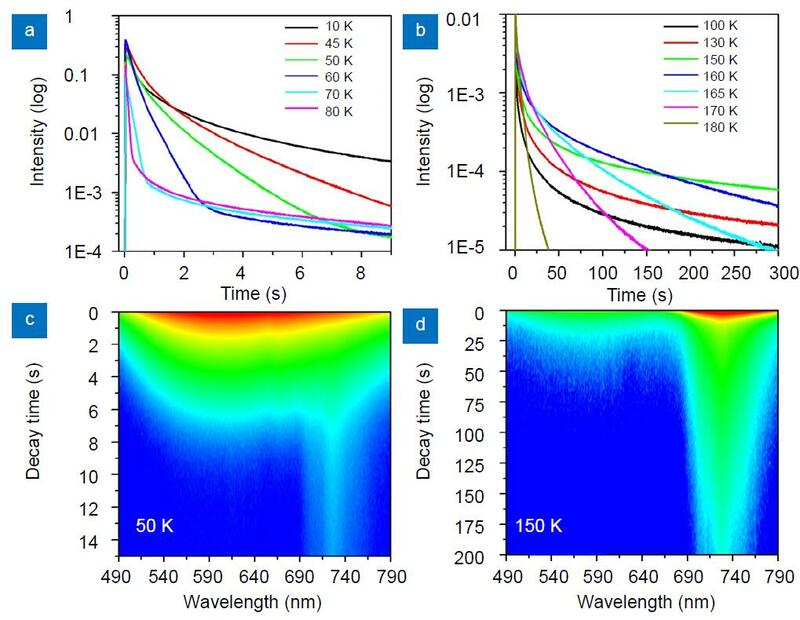 (a) (b) Decay traces of the visible emission in ZnO after the ceasing of 385 nm excitation under different temperatures; (c) (d) the time resolved luminescence spectra under 50 and 150 K.
Professor Xu Shijie of the University of Hong Kong has been working on optical physics in semiconductor and semiconductor optoelectronic devices for a long time, and has made a number of important research work in the field of GaN, ZnO and semiconductor self-assembly quantum dots. He has published more than 150 SCI papers, of which more than 10 papers have been cited more than 100 times. The total number of citations is more than 4,200 times so far (to July 2018) and the personal H index is 31. He has been the advisory board, procedures Committee member and session chair, and made invited reports for more than 20 times in many international and domestic academic conferences such as ACUP, 31st ICIMM, 14th SIMC. He chaired a number of research projects of the Hong Kong RGC and two major scientific instrument projects of the HKU Development Fund, and established the Laser spectroscopy Laboratory in Physics department of HKU. In 2010 He obtained of the Overseas and Hong Kong and Macao Scholars Cooperation Fund of the National Natural Science Found of China (that is, overseas Outstanding Youth Fund). Ye H G, Su Z C, Tang F, Bao Y T, Lao X Z et al. Probing defects in ZnO by persistent phosphorescence. Opto-Electronic Advances 1, 180011 (2018).